FLIR Ex-Series cameras are point-and-shoot thermal imaging cameras that give you access to a new dimension in inspection capability. A FLIR Ex-Series camera is an affordable replacement for a spot pyrometer. It provides a thermal image with temperature information on every pixel. The combined image storage of the new MSX®, thermal and visual formats make the cameras incomparably easy to use. The cameras are extremely easy to understand and operate, designed for entry-level users. The cameras are intuitive and come with a full manual. 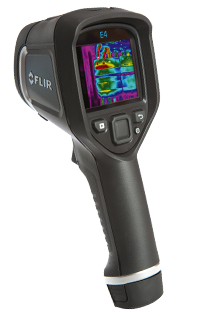 FLIR Ex-Series produce instant, point-and-shoot JPEG thermal imagery with all required temperature data included. The fixed focus-free lens makes using the FLIR Ex-Series a snap. FLIR Ex-Series weighs only 575g, and is easy to store in a belt pouch. Visible light camera makes observing and inspecting faster and easier. FLIR Tools software is available for free download for all Ex-Series users. Measures temperatures up to +250°C and detects temperature differences as small as 0.06°C (FLIR E6 / FLIR E8). The innovative MSX® feature produces an image more rich in every detail than ever before. Combined image storage including MSX®, thermal, PiP and visual. * Features dependant on camera model, please check technical specifications for more details.